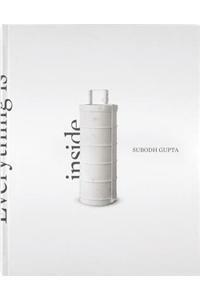 Everything is Inside is a compilation of some of the most famous works of one of the finest artists of India, Subodh Gupta. This monograph is designed and edited in collaboration with Subodh Gupta. The book has over 200 high-quality images of his work. Everything is Inside will help the readers get a deep insight into his work, his process of working, and the cultural, biographical and intellectual aspects of his work. The book has essays by Aveen Sen, Sunil Khilnani, Germano Celant and Raqs Media Collective, which will give the readers a detailed knowledge about the artist. Subodh Gupta is an Indian artist. His work encompasses sculpture, installations, photography, painting, performance and video. His work is a necessary part of all major international collections and has been shown in the leading commercial galleries of New York, London, Zurich and New Delhi, at the Venice Biennale, Art Basel and Frieze Art Fair.